What links the modern city of Tokyo with the popular streets of Caracas? What bonds the feelings of a New York college student to a young boy in Senegal? What connects an intellectual Spanish teacher with a Japanese teenager obsessed with manga animation? 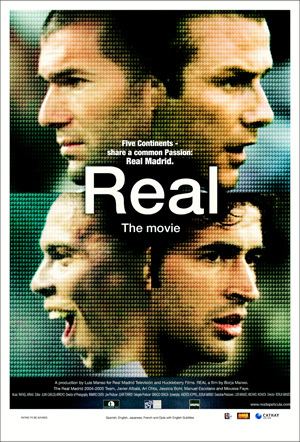 Real is the story of five lives in different continents, who share a common passion: Real Madrid. Real is a chronicle that weaves dreams and reality, revealing through the experiences of these characters how the international phenomenon of Real Madrid has infused the lives of people around the globe. Real is the first official movie of the leading football sports club Real Madrid and provides the exceptional opportunity of witnessing through a privileged window the behind-the-scenes and unveiled reality of a team that has inspired a world of passion. Like them or hate them, Real Madrid is a football club that has been consistently assembling one the most admired squads in the world. Therefore, to call them one of, if not the best football team in the world, is most fitting. With various trophies and championships to its name, the club has had a most illustrious history. Its stable of players; aptly labeled the Galacticos (the Galaxy of stars) has churned Spanish greats like DiStefano and Raul and bought remarkable players like Zinedine Zidance, Luis Figo and David Beckham. If so, it is no surprise that the chap from GOAL! would be moving to Real Madrid in the sequel. But, “Real” is not that film. In fact, it is baffling why such a film like “Real” has been made at this time. The film revolves around five smaller stories of five different lives in five different continents. Well, six, if you count the behind the scenes look at Real Madrid, the football club. If any, this official movie of the club aims to show that people around the world are connected by their love for the club. At this juncture, if you’re interested in watching this film for the acting, I regret to inform that there is not much of that. In Madrid, a schoolteacher tries to understand what Real Madrid is all about. In New York, a young female footballer fights to make a comeback after a horror injury similar to that of Ronaldo’s befalls her. In Tokyo, a teenage boy is demonized by David Beckham who is the subject of his girlfriend’s adoration. In Caracas, a young boy discovers that his coach is his long lost grandfather and in Senegal, a father who walks for miles just to watch Real Madrid on television, takes his son on a journey to live the boy’s dream. The stories, whether real or not, appear disjointed and directionless. They could each have been stand alone stories and the love for Real Madrid could still have been brilliantly captured. While the film aimed to show how people around the world are connected by supporting the club, it actually failed to do. Instead, the end result was having stories that were clearly stronger and had more screen time than the others. The one consolation though is witnessing the day-to-day running of a football club. The thoughts of the players, manager and advisors are openly discussed, tactics included. The happenings on match day are also shown from the pitch to the stands. The only nerving thing was to watch the football match sans commentator but filled with electric music. It was like watching ESPN on Sunday morning on an overdose of MTV. While the football club may be held in high regard, the film however, pales in comparison to its majesty. Sure, the film might have been made by people who love the club but the result is one that is flawed. The audience would better appreciate the individual stories if much thought were put into them. Actually, if you remove the individual stories, you would find Real Madrid’s Season in Review on DVD a much better alternative. Bring on GOAL! 2 then.